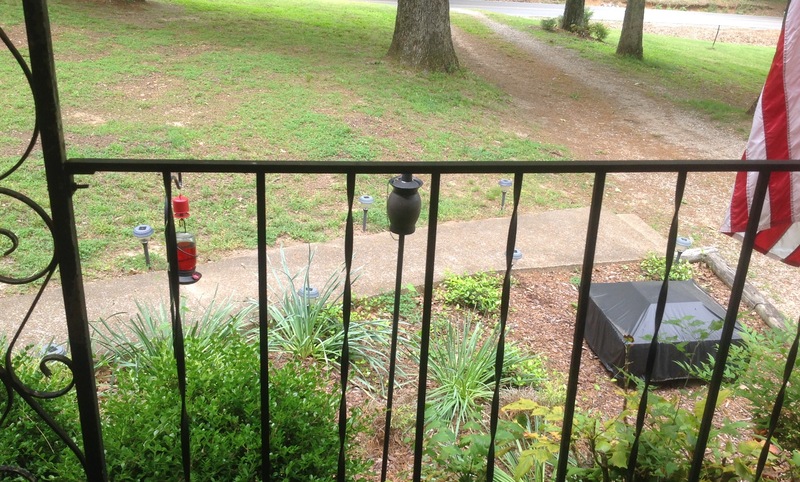 This is Lil Dawg, my front porch ‘study buddy.’ Our morning routine is a fairly simple one. Once I’ve showered, dressed, and am ready for the day, we go outside. I walk down the driveway to get my newspaper and he goes to the yard to do his business. Then he sits on my lap as we survey the scenery enjoying the world before us. He keeps his eye out for a chipmunk who lives in the flower bed in front of the porch. 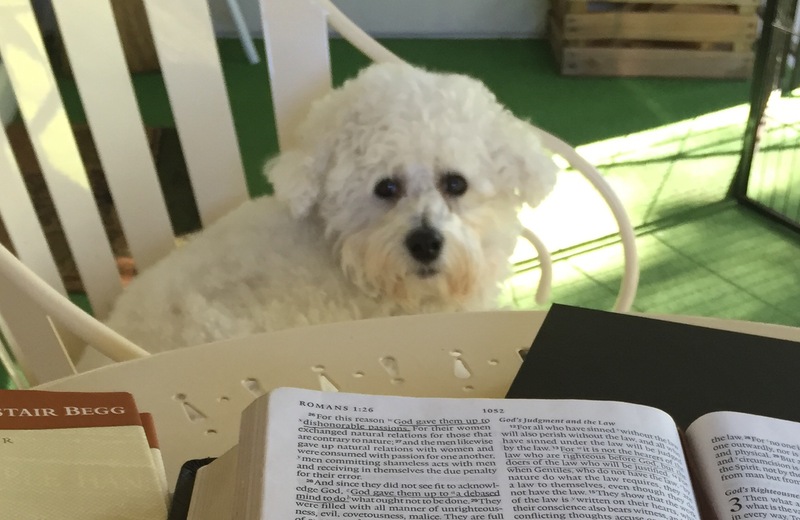 After a few minutes, he gets into his chair and I read my paper, spend some devotional time with the Lord, and then dig into some Bible study. It’s a nice way to start to the day. Today was different. As I picked up my paper at the end of the drive, I saw him racing across my neighbor’s yard headed straight for the county road. I imagine it was a squirrel or something that caught his eye, but all I could see was him running full speed to a a dangerous place. Immediately I shouted at him and thankfully, he stopped and ran back to me. But the rest of the morning wasn’t the same. He sat on my lap, but he wasn’t acting quite right. He kept looking back at me like he wasn’t sure what I was going to do next. I had reprimanded him and he wasn’t sure how to take it. It was for his own good, for his safety. I did what I had to do because I did’t want him to get hurt. To be quite honest, I also didn’t want to experience the heartache and pain of seeing him injured or killed. Now I don’t know what goes on in a dog’s mind. But my imagination tells me that he was wondering what my problem was. After all, he was only doing what a dog does. You see a squirrel, you chase him down and run him off. (We’ve had squirrels in our attic and to be honest, I’m all in favor of keeping them away from the house!) He was acting true his nature. He’s a dog. He was doing his part to protect our home from the invader. He was doing me a favor. But I saw the big picture. While he was attempting to accomplish a great deed for me, I knew he was out of his league and needed to leave that task in my hands. Well, Lil Dawg didn’t stay on the porch this morning. He went into the house and right now is laying behind a chair taking a nap. I wonder how many times I’ve run full speed into a situation attempting to accomplish something for my Master in my own abilities only to be reprimanded out of love and concern for my well being? (To be honest, I don’t have nearly enough fingers and toes to count that high!) Today, I’ve thought of my Father’s heart. I wonder how many times His heart ached when I’ve taken off on my own? It’s not that He can’t handle whatever mess I get myself into. It’s that He loves me so much that He wants me to listen to His commands and respect the perfect boundaries He’s set in my life. He calls me down out of love. He wants me to trust His ability and wisdom. When reprimanded by my Master, my thoughts tend to lean into how disappointed I am with myself; how I’ve messed up, how I feel. Today, I am thankful for a loving God who taught me about His heart and His love for me. 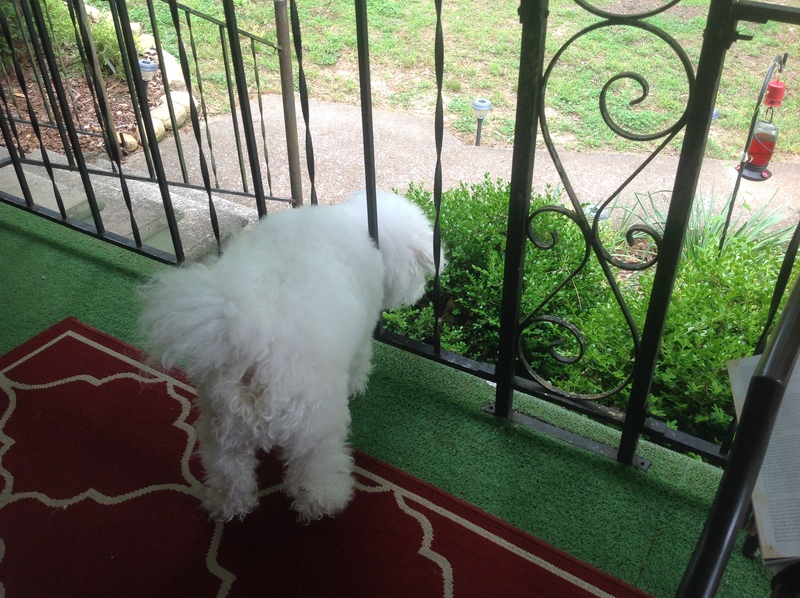 By the way, before I could finish this post, Lil Dawg heard a truck pulling my neighbor’s drive. He wanted out on the porch to check things out. Once he knew we were safe, he went back to work. All is well. 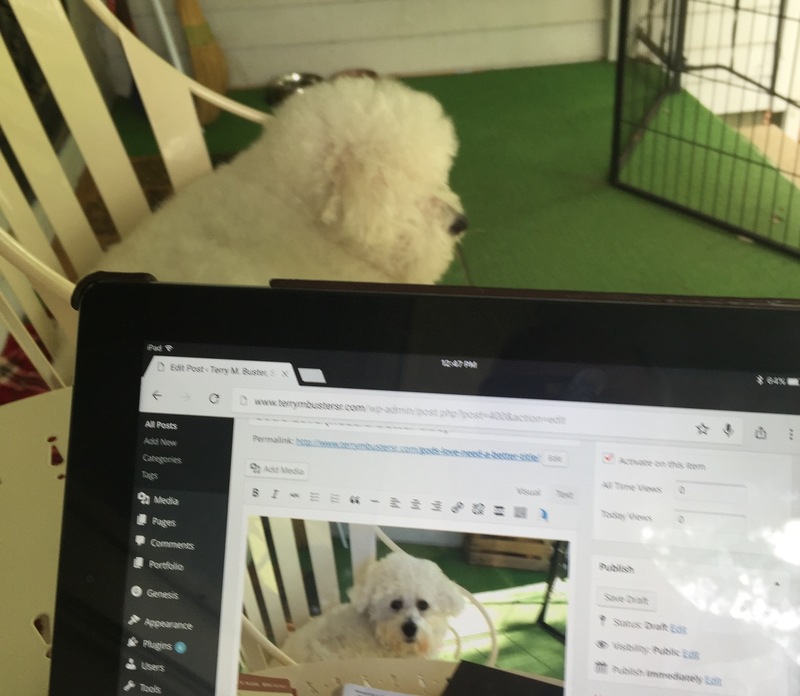 I’ve got my study buddy back with me on the porch. All is well for there is nothing I can do to make my Master love me less than with an infinite, perfect, saving love. My pastor just completed a series of sermons on Biblical success from Psalm 78. Not only was I challenged to be a successful Christan as God spoke through Bro. John, but I was reminded of the increased attention in recent years from preachers and teachers on how God measures success in His people. The old, “noses, and nickels” as the primary measurement of a successful church is giving way to a greater emphasis on obedience, faithfulness, and sacrifice. 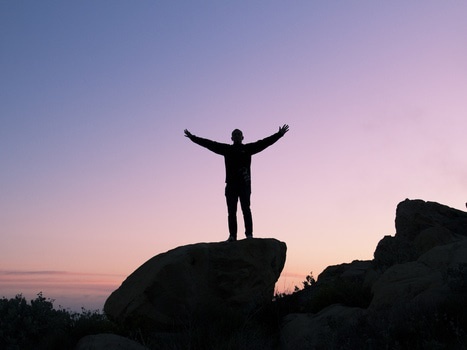 A growing understanding that it is ‘only God who gives the growth’ (1 Corinthians 3:7) reminds us that success in His Kingdom is measured differently than success in the eyes of the world. We know that keeping track of the ‘numbers’ helps us gauge our progress as well as reveal possible symptoms of issues which need to be addressed. But we also know that the Bible instructs us to leave the results in God’s capable hands. Our Sunday School class just finished four weeks of evangelism training. One constant theme was that our responsibility and success in evangelism comes about as we share the gospel regardless of how others respond to the gospel. In other words, when we share the gospel by faith we have been successful. There is another measurement of success in the Christian life that, at times, we aren’t too crazy about. I’m talking about the world’s reaction to the gospel in general and to us in particular. Jesus told us (John 15:18) that the world would respond to us in the manner and measure in which it responded to Him. The more we live like Jesus the more the world will treat us like Jesus. Some will respond with acceptance. However, many will respond with anger and resentment. Both of these responses are signs of the Holy Spirit’s work of conviction of sin. If I were to ask you to point to an occasion when Peter was successful in being like Jesus you might well point to the Pentecost sermon in Acts 2 when thousands were saved. That would be a good example. I’d also point to another occasion when Peter’s success in the Kingdom of God was just as evident. In Acts 12, Peter was under arrest for sharing the gospel. It’s that 6th verse which caught my attention helping me to see an affirmation from Heaven that Peter was most certainly doing something right in spreading the gospel. While under arrest in Herod’s custody, Peter was in jail, sleeping between two soldiers, bound by chains, and had two sentries standing guard at his cell door. That Herod went to such lengths to shut Peter up is certainly a sign of a successful ministry as well as a reminder that God’s blessing was on Peter’s life. The world feared this uneducated, unlearned fisherman and the simple words he proclaimed that they treated Him like they treated Jesus. In our day we see a growing animosity and fear as the world reacts to the deeds and words of faithful Christians. From our own personal experience we know that our ego-centric, sinful reaction to the conviction of the Holy Spirit is one of anger and resentment. We also know this kind of response is a sign that the gospel is opening our eyes to who God is and what God expects of humanity. As believers we know that our resentment when under conviction is a matter of the Spirit reminding us of the eternal truth of the gospel. We know we must confess and repent. When we successfully live the gospel, share the gospel, and leave the results in God’s hands, the world will often respond with all the resistance she can muster. When that happens, we can count ourselves successful in the eyes of God and resolve as did the saints of old to grow in faithful obedience to our Lord’s commission to be witnesses to all the world. Our call from God is not to look for the fight. Rather we are called to share the gospel in the manner He has prescribed in Scripture. When the fight comes, we respond with love and count ourselves successful in the outcome God ordains. I’m getting a new Bible. Actually, it is a replacement Bible for one I bought three years ago to use as my primary reading and pulpit Bible. The back cover separated from the book and eventually I’d lose the cover completely. Fortunately, Crossway has a lifetime warranty on this edition and they’ll replace it for me at no cost. There was one condition that I had to seriously consider. In order to get the replacement Bible I had to send them my used Bible. This was no small decision on my part. Alhough I only had my Bible three years, I had underlined a lot of verses and passages in it that had meaning to me personally. I also underlined important verses or phrases to emphasize as I was preaching. Though I had not written many notes in the margins (I have a couple of other Bibles for that), I did circle words and phrases that guided my understanding and were helpful in seeing passages in the greater context of Scripture. This was the Bible I turned to in the darkest days I experienced in vocational ministry. God spoke to me, guided me, and gave me peace and courage through this Bible. I had to ask myself if I wanted to give it back or keep it. In the end, my decision to send it back was not as difficult as I first imagined. With this new Bible, I get a fresh start. While those underlined passages are helpful by reminding me of what I have learned, they can be a distraction to what I need to learn now. While the highlighted passages are helpful when I’m seeking a certain passage or verse, I’ve discovered over the years that a “clean” copy leads me to discover important ‘new’ verses, find deeper meaning, and have a fresh experience with my Lord through His Word. In my consideration I couldn’t help but remember Paul’s words, “….One thing I do: forgetting what lies behind and straining forward to what lies ahead, I press on toward the goal for the prize of the upward call of God in Christ Jesus” (Philippians 3:13-14). It’s not that I don’t treasure how God used that Bible in a critical season of my life, but I anticipate God’s greater work in and through my life in what lies ahead. I’m getting a new Bible! I’m excited about a fresh encounter with God’s Word and looking forward to how God will speak to me in this copy of His Word and how He intends to use this new Bible in the ministry which lies ahead. Isn’t it glorious how God can give us a fresh start in life even through something as simple as a cover separating from a book? 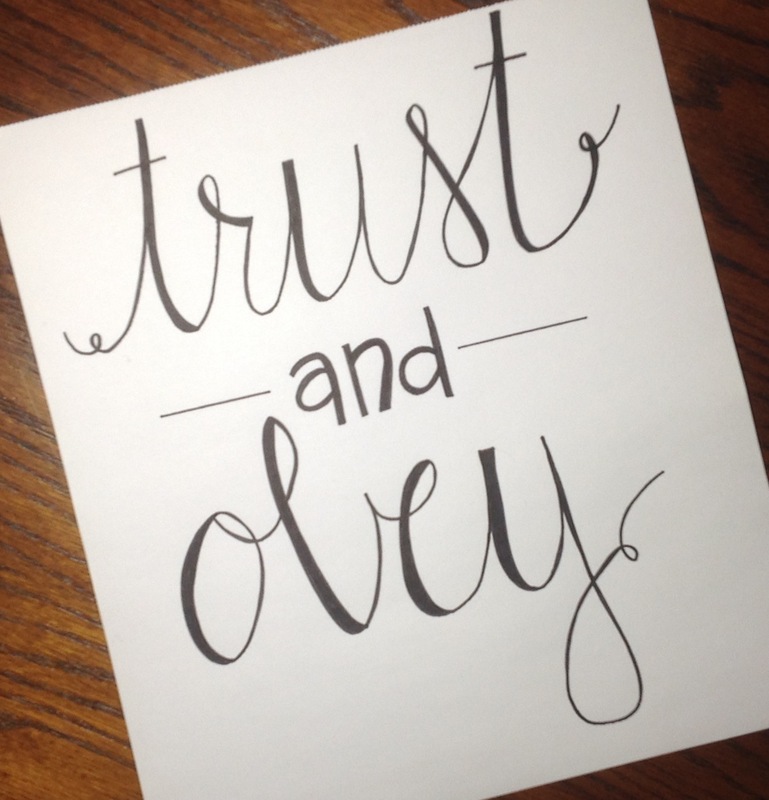 Simplicity of Obedience …. Yes or No. Seriously, when it comes to obeying God, we have only one of two choices, “Yes” or “No”. Obedience or Disobedience. How can it be any other way? It is a simple choice. I’m not saying that obedience is easy, because most of the time it isn’t. When believers choose to obey God rather than man, we choose to reject worldly notions of what is right and what is wrong. Actually we go against the world’s mantra of following the path of least resistance in order to get along. By definition, obeying God means that we can and do step on the toes of our culture. After all, Jesus tells us that if we follow Him the world will be against us for it is against Him (John 15:18-20). We might as well acknowledge that our choices do have consequences. There will be times when obedience will be hard because we quickly find ourselves at odds not only with the world in general, but with friends, co-workers, team members, classmates, and yes, even within our family. Yet as faithful Christians, we know that God doesn’t desert us when we choose to follow His way over the way of the world. In reality, we draw closer to God through our obedience and in this we gain strength, wisdom, and peace. When we obey Him we choose to step away from popularity contests, conventional human wisdom, and figuring it out for ourselves. When we choose to obey our life is simplified because we know what kind of attitude we must have (the mind of Christ – Philippians 2:5); we know what kind of feelings we must have (the love of Christ – John 13:34-35); and we know who is in charge (Jesus Christ, King of Kings and Lord of Lords – Revelation 17:14; 19:16). There is an added bonus that comes when relying on God’s strength. He is not only strong enough to get His work done through us, He also enables us to endure the attacks of the enemy and to do so victoriously. He knows just how to deal with those who oppose His will and take care of those who come after His children. Why do we foolishly think we know how to deal with our accusers when God said He’d take care of it for us? “If God is for us, who can be against us?” (Romans 8:31). Consider the blessings which come through obedience. Better yet, meditate on what we receive from our Lord when we choose to simply obey Him in a well reasoned, Biblical manner. God promises to be with His children as they faithfully persevere in both the good and the bad seasons of life. Jesus promised to be with us always (Matthew 28:18-20), but isn’t His presence all the sweeter when we, like Peter, proclaim Him to be “the Christ, the Son of the living God” (Matthew 16:16)? Isn’t it assuring to know the promise that we are His eternally (Romans 8:31-39; Ephesians 1:11-14; Philippians 1:6)? The confidence we gain when people applaud us as we follow the crowd peaks immediately. Admit it, as soon as the crowd stops cheering we seek new ways to get their approval and applause. This soon becomes a vicious cycle draining our strength. The confidence God gives in obedience builds our character in Christ giving us greater courage to face our detractors. Is there anything that gives us more confidence in life than doing the right thing, the right way? Surely our faithful obedience is the supreme act of doing the right thing, the right way, which is another way of saying doing it God’s way. Paul speaks of the peace that passes all understanding (Philippians 4:7). Recently I’ve come to experience the peace of God in deeper ways as I’ve obeyed Him in the simple, everyday course of life. The blessing of peace through obedience is hard to describe, but it is there. One of the key cornerstones of obedience is recognizing where true power and authority lies. The more consistent our obedience, the more we come to know just how faithful, powerful, and reliable He is. As this awareness grows in our lives, we find contentment in letting God be God in every aspect of life. One of my favorite Bible verses is Isaiah 66:2. Having declared His overwhelming sovereignty, God reminds the prophet, “…This is the one to whom I will look: he who is humble and contrite in spirit and trembles at my word.” I don’t know about you, but I find great blessing in knowing that in my humility, God is looking to me. Remember, humility is that wonderful virtue which allows us to set aside our ego, our obsession to figure it all out as well as our feeble attempts to advise & direct God. Aren’t these things worth laying at the feet of our Lord and Savior? I don’t know about you, but I’m tired of trying to tell God what to do. I think, no, I know that He’s got a better plan than I could ever devise. “Now to Him who is able to do far more abundantly than all we ask or think, according to the power at work within us, to Him be glory in the church and in Christ Jesus throughout all generations, forever and ever, Amen” (Ephesians 3:20-21)! As I stated earlier, obedience will not always be easy. The path will be difficult as we deal with the world around us and our inner struggles. As the hymn writer so eloquently put it, we will have we have “fightings within and fears without.” In spite of the fightings and fears, there is no greater, nobler path than to walk the path of God’s Power and Blessing which comes through simple obedience.